You’re back on the road, heading for the upstate country again. Once out of the city, your biggest obstacle on the road might not be cars, but animals. Animals cause more damage to automobiles than people give them credit for. Most of the time the animals mean you no harm, but when it does happen, the damage can be serious. Animal damage to your car is only covered under your insurance policy if you have comprehensive coverage. Any type of animal damage falls under comprehensive coverage. If you hit a deer or another animal, it’s easy to think that it would fall under collision coverage since you collide with the animal. However, this is the one type of collision that is not covered by collision coverage. The good news is that comprehensive coverage is almost always cheaper than collision coverage. Comprehensive is also the coverage that protects your vehicle from things like fire, hail, theft, and pretty much anything that is not an actual collision with a solid object. Comprehensive claims also have a deductible. This is the amount that you have agreed to pay out-of-pocket before receiving any money from the insurance company. However, you never have to come up with this money up front. For example, if you have $5,000 in damages with a $500 deductible, then the insurance company would simply pay out $4,500. They pay out the claim amount (only if you have enough coverage) and just subtract the deductible from that amount. Your deductible will play an important factor in determining whether to turn in an animal related claim. Depending on the severity of the accident and the amount of damages you have to your car, it might make more sense simply pay for the entire amount out of pocket. For example, if you have $800 in damages with a $500 deductible, the insurance company would only pay out $300. Since filing the claim could potentially raise your insurance rates at your next renewal, you might be better off just paying the full amount. 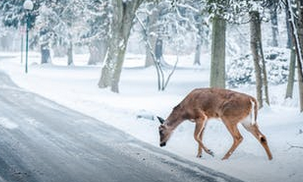 The first animal that comes to mind when talking about damages to cars is usually deer. “Like a deer in headlights” isn’t a phrase for nothing, as thousands of people find out each year when they collide with a deer on the road. However, deer aren’t the only animal that can be hazardous to your car. Animals such as rats can get into your car and chew on the wires, causing unseen damage that you’ll notice the next time you turn on your car. This can be a potentially nasty problem, and rats aren’t the only type of rodent that can get inside. Fortunately, comprehensive will cover this as well. Depending on the type of car you have and the wiring system it has, this problem could set you back well over a thousand dollars. Hitting a dog isn’t quite as simple as hitting a deer. Dogs usually have owners, which causes its own unique set of circumstances. If you hit a dog, the best thing to do is stop and tell the owner. If you’re right in front of a house, then this should be easy to do. If you’re in the city, it might not be so obvious. If you can’t locate the owner, the best thing to do is call the police and report it. The owner will likely be calling the police soon to find out what happened and can get your information. Technically, the dog’s owner should file the claim under their own homeowner’s insurance. Their policy should cover these types of accidents, which means your own car insurance won’t have to pay. Even if they don’t pay initially and you file the claim under your own policy, it’s possible that your insurance company will subrogate against the dog owner. This just means that the insurance company will pay the claim money to you, and then will legally seek that money back from the dog owner. Colliding with a bird usually results in damage to your windshield and a broken windshield can cost upwards of a thousand dollars to fix. This is where having Full Glass Coverage can be great. This is an extra endorsement that you can put on your policy (before a claim) that will give you a $0 deductible to fix any type of glass breakage. This means that after you file the claim with your insurance company, they will pay for the full amount to repair and replace your windshield. Accidents involving animals can be sad for the owner, the driver, and can also cause a lot of damage to your vehicle. Having comprehensive coverage on your vehicle helps cover the cost to repair this damage.